November jobs report: We added 321,000 jobs. Bravo, economy! 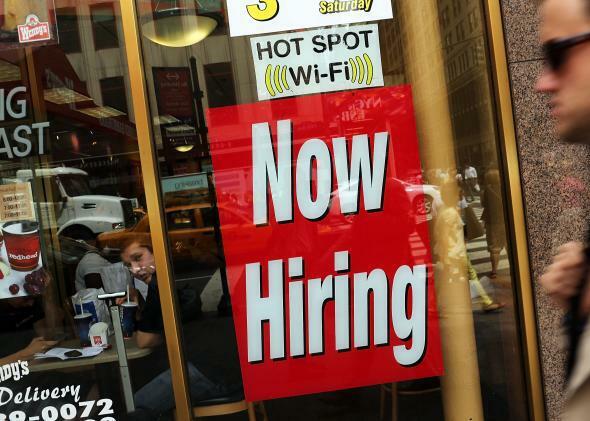 The U.S. added 321,000 jobs in November, the biggest monthly boost in almost two years. Meanwhile, the unemployment rate stayed steady at 5.8 percent. Here’s the long-term post-recession picture. And here’s the three-month rolling average, which should give a slightly less erratic look and the long-run trend. So, is this a “dominant” jobs report, as some have put it? Well, we did add lots of jobs, which is something to feel good about. And there’s certainly more good news packed inside the government’s release. The Department of Labor revised up the last two months of job gains. The labor force participation rate, which is at lows not seen since the 1970s (you know, before women had fully entered the workforce), has at least managed to hold steady since April. Some of the broader measures of pain in the labor market, which count Americans who can’t find a full time job for economic reasons or who want a job but have given up on searching, have also been trending steadily downward. On the other hand, private sector wages are still only up a low 2.1 percent for the year—which is to say, the job market isn’t getting so hot that employees suddenly have the power to ask for a significant raise. When that happens, then we’ll really have something to celebrate.